Granite Services Los Angeles: Your Granite Countertops Have Been Damaged — Now What? Your Granite Countertops Have Been Damaged — Now What? Granite is a popular choice for homeowners across the United States, and it’s easy to understand why. Granite is durable, beautiful, and easy to maintain, making it the perfect option for virtually any home. In today’s post, we’ll provide you with a step-by-step guide to dealing with damage to your granite countertops. Concrete & Marble Transformerz is proud to be the Top Rated Local® restoration company in Los Angeles. Whether you need small granite repairs or full-scale granite restoration, we’re the team to call! Learn more about granite restoration in today’s blog, and contact one of our stone restoration experts today to schedule a free consultation for your home or business. Has Your Granite Been Damaged? Like many natural materials, granite will react when exposed to certain substances. More specifically, acidic substances will react with your granite and cause dull spots to form. This kind of damage is known as etching, and it’s one of the most common reasons that homeowners call us for granite repair. Sealing your countertops regularly and handling acidic substances with care will prevent your granite countertops from etching. If your granite has etch marks, then you should call Concrete & Marble Transformerz to schedule a free estimate for your home. Etch marks can normally be polished out, so don’t worry if your granite has a few blemishes! Granite is a porous stone, meaning that it will absorb liquids that sit on the surface for long enough — including water. Stains are often barely noticeable when your granite is darker in color, though it’s fairly easy to see stains if your granite is lighter in color. Properly sealed granite won’t stain easily, but the good news is that stains are often easy to remedy. Many DIY guides on the internet will claim that you can clean stains with household ingredients, but our restoration company utilizes highly effective chemicals that provide you with the best chance of completely eliminating the stain. 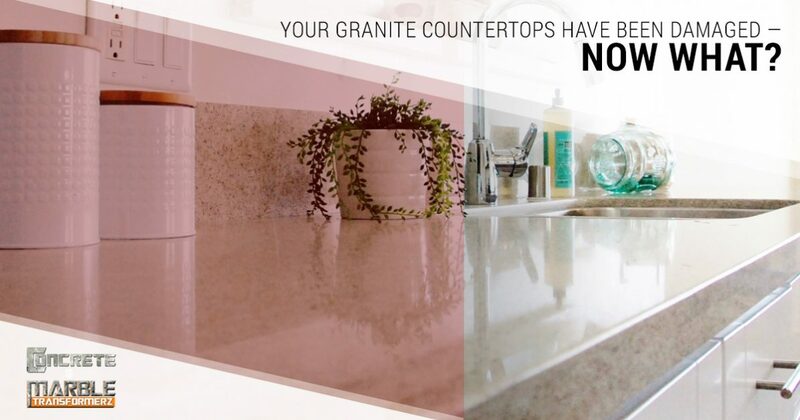 Don’t take the risk of further damaging your countertops — call an expert if you need to remove a stain from your granite. If you’ve had granite in your home for an extended period of time, then you may have noticed that certain areas have become cloudy or hazy in appearance. Generally speaking, a cloudy surface isn’t any cause for alarm. 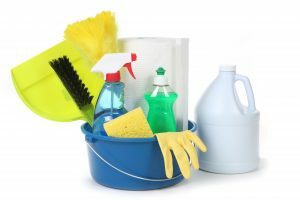 It’s most likely due to a cleaning product that isn’t designed specifically for granite, so be sure that you pick up a cleaning product designed specifically for granite the next time you’re at the store. Clean the surface of your granite with the new product, and if the layer of haze doesn’t go away, just give us a call for granite restoration. Using abrasive or acidic cleaning products can deteriorate the surface of your countertops, so the damaged layer may need to be treated by a professional. Your countertops will likely need to be resealed and polished, but the good news is that the damage won’t be permanent. Keep an eye on our blog page for future posts in which we’ll continue to provide you with information about granite restoration and granite repair. If the natural stone surfaces in your home need to be polished or resealed, then give Concrete & Marble Transformerz a call! Our stone restoration experts will gladly help you come up with an individualized treatment plan that leaves your floors or countertops in like-new condition. We look forward to speaking with you soon!